Scream - 你 Think 你 Know Movies? if they replace neve campbell for sidney would 你 like it why 或者 why not? Do 你 own any Scream merchandise? Who did the best cameo in the trilogy? Do 你 think that Neve Campbell was perfect for the roll? Why Tatum stuck in the cat door? What shocked 你 most, in "Scream"
Before I start, this is 由 no means an invitation to 搜索 for the exact website I'm referencing to and be mean to commentators. I just thought people would find this funny. Thank you! Before I start, I should problebly go ahead and mention that I am very disapointed that this isn't just a sequel, it's a remake of the first one. I joked about what if we went in and saw it and it was a remake, but I didn't think I would jinx it. This is an elaborated 文章 based on my 评论 and posts on couple of 粉丝 picks and 论坛 topics here. "But this is life. This isn't a movie." "Yes it is, Sid. It's all one great, big movie. 你 just can't pick your genre." Billy may not have an outstanding personality as a killer but he certainly has much to give as a whole character. I 爱情 him to bits! 1.) It's opening scene kicks any scary movie's opening scene's but 6-0 any day. It's a legend and very realistic! No wonder the selling of caller ID systems six-folded after the movie came out. Even after seeing the film a hundred times, the opening scene scares the ever-living crap out of me any time I'm actually focusing to watch the movie, as in get really into it. And at any attention amount it's affective. 或者 tried to kill. This is only about the original Scream because I don't care enough for the sequels. 1.From the opening scene, moviegoers in 1996 were scared silly 由 Wes Craven's "Scream." After all, the character played 由 the most famous actor in the cast was done in before the opening credits. But that wasn't how it was originally planned to be. There is a 20th anniversary screening of SCREAM on 12/8/16 at the TCL Chinese 6 Theatres in Hollywood. A Q&A with David Arquette follows the screening. Trivia & DVD prizes and more. Ticket includes complimentary 啤酒 for guests who are 21+. 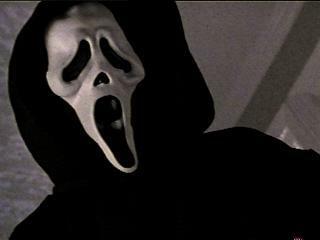 a pop quiz question 增加: who is the first to die in the original scream? At what 小时 the curfew begins in the first Scream? Billy killed himbry and Stu helped him hang in the field? Have cameras in the school! He was not a prank!